The next review on Smokehouse Jerky Co. will focus on a 3 ounce/84 gram bag of their Carolina Reaper flavored beef brisket jerky. This flavor is described as adding Carolina Reaper peppers to their Original flavor creating a flaming hot jerky. The jerky was graciously submitted for review by one of the owners, Patti Fonseca. The liquid marinade is comprised of an average brand of teriyaki sauce, an alright brand of Worcestershire sauce, and healthy lemon juice. The cheap highly processed sweetener high fructose corn syrup (HFCS) is listed as an ingredient to lose a rating. 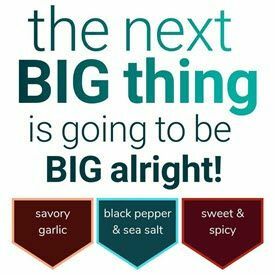 There are some healthy ingredients added such as garlic, black pepper, and ginger. The heat is achieved from Carolina Reaper pepper, ghost pepper, and cayenne pepper. Hot peppers are healthy if eaten in moderation, which flush toxins out of the body. The sugar level is respectable at 3 grams of sugar per 28 grams of jerky. The salt level is low at only 110 grams of salt per 28 grams of jerky. This jerky qualifies to have no sodium nitrite, or any other similar unhealthy preservative. Instead, sea salt is the main preservative used. 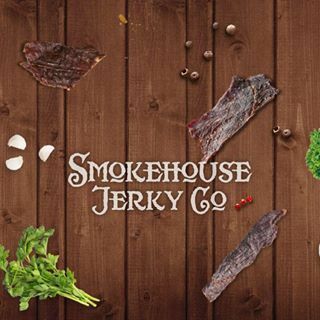 With more kudos to Smokehouse Jerky Co., this jerky has no MSG added. When I open the bag, I am met with a delicious smelling blend of aromas. I can’t quite put my finger on it, I just know this is going to be another one of those white knuckle jerky rides. The jerky is sliced small to medium, and it is sliced to a medium thickness. The jerky is soft and a bit moist, and it leaves an ever so slight amount of moisture on your fingers. The first flavors I detect are salt, black pepper, soy, garlic and then WHAM! !, the Carolina reaper enters the field like a wrecking ball. I am overcome with a spectacularly hot, yet exceptionally tasty cavalcade of heat, like an inferno of fire, breathing down on me like one of Daenerys’ dragons from Game Of Thrones. 56, 28, 44, hut, hut, Brady takes the ball and drops back, looks around, then BLAM! !, Aaron (Carolina Reaper) Donald crushes him from behind. He takes a bite of Smokehouse Jerky Co. Carolina Reaper jerky and says “Stay down Tommy, I’m the reaper, and I’m coming for you!” Tom gets back up, dusts himself off again and says “Damn, that’s the 8th time he’s knocked me down. I’m no match for Aaron the Reaper. Guys, let’s take our deflated footballs and go home, we are no match for the Reaper”. Game over, Smokehouse Jerky Co. Carolina Reaper wins the Super Bowl. A 10/10 gentlemen, GO RAMS!!! This resealable plastic bag has a label affixed on the front, and nothing on the back. 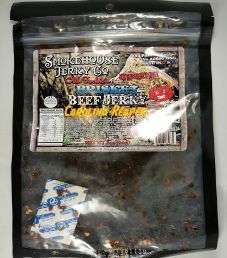 The label has a fairly detailed picture of a wooden shack with a “Jerky Co.” sign, along with a drawing of a menacing looking Carolina Reaper hot pepper.